Beto y los Fairlanes are a latin-jazz fusion ensemble from Austin, Texas. The group was founded in the 1970’s by Robert “Beto” Skiles (piano) a native of San Antonio. The octet also includes John Fremgen (bass), Stephen Summer (drums), Laura Mordecai (percussion), Rich Haering (trumpet), Jake Lampe (alto sax), John Mills (tenor sax), and Michael Mordecai (trombone). The group was inducted in the Austin Chronicle’s Music Hall of Fame earlier this year. They were also inducted into the South Texas Music Walk of Fame. Over the years, Beto and the Fairlanes have created a tribe of loyal fans who continue to gather for rituals of dance, song and tropic frolic. One unifying principle that seems to draw both listeners and dancers to Beto’s concerts is the irresistible sense of fun that Beto y los Fairlanes are able to generate. Rarely do players of this level of musicianship come together and play with such obvious enthusiasm. The band’s high flyin' horns, explosive percussion and Beto’s easy sense of humor take you to a celebration of musical traditions both north and south that meet naturally in the beat of their music. Even the recordings by Beto and the Fairlanes evoke the flavor, atmosphere and inspiration of a live concert played under the stars on a tropical night for people of many cultures and backgrounds. The dance floor is filled with dancers. There's a sense of magic in the air. Beto y los Fairlanes performs the finale of their 40 moons celebrating 40 years at Threadgill’s South, on Saturday, September 29, 2018. 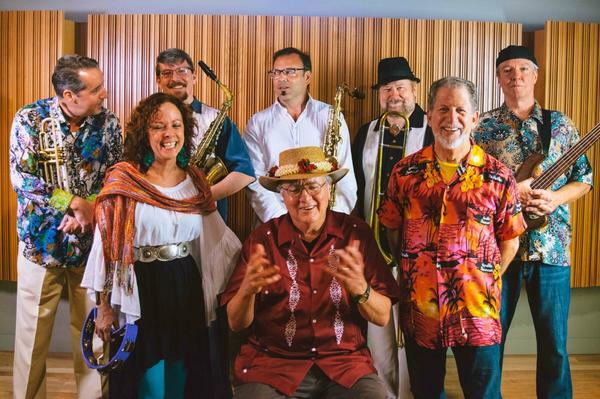 The music of Beto y los Fairlanes is Robert Skiles' whimsical creation that started out as music for a Latin Jazz ballet entitled "El Perdido." However, when the ballet failed to materialize, Robert, at the invitation of his friend and KUT DJ Fred Bourque, recorded the "El Perdido" music in studio 1A at the University of Texas. That recording was later featured on Fred’s show. The response was immediate. All of the radio station's phones lit up at once. At that moment, the band created a fan base that continues to grow to this day, 40 years later.